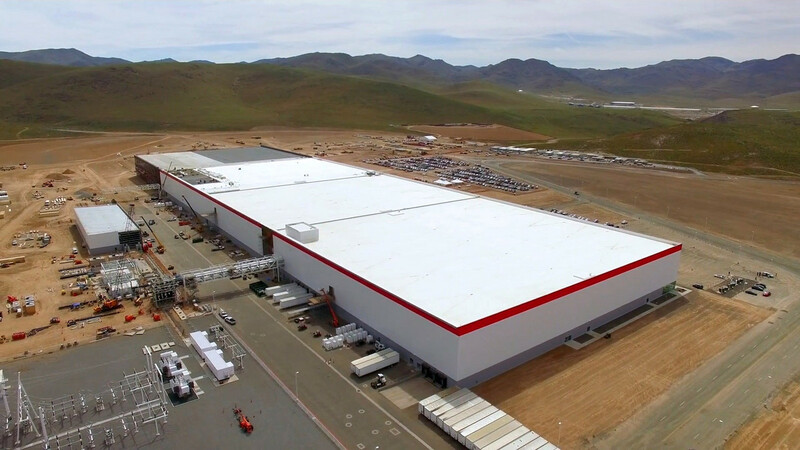 On July 29th Tesla held the grand opening of their new factory, the Gigafactory. When it will be finished in 2020 it is supposed to have the largest footprint of any building in the world. As of now, it has only 3 of the final 16 sections build (the 4th one consist of raw steel beam frame) this translates to 14 percent of the expected final factory size. By this time Tesla in partnership with Panasonic had spent $431 million on Gigafactory while the planned total investment is estimated to be around $5 billion. The factory is being built in stages. The first sector is fully operational with machines on one side (robotic arms and very big machines responsible for cathode or anode processing) and designers on the other (separated only by hip-height dividing wall). The second sector consist of fully prepared space (painted walls in place) and machines being assembled. The third section is construction site where walls are being painted and assembled. The third as mentioned earlier consist only of raw steel beam frames. What is so innovative in this factory is the pursuit of manufacturing perfection. The huge design team working on the site, next to robots, is planning how to space out everything as efficient as possible. Elon Musk expressed that if the designer’s team would concentrate their efforts on improving batteries itself their success would be marginal but when they were used to improve the efficiency of production their impact improved the performance by a factor of 3. This only shows that not only designing innovation is important but also its manufacturing process as it might decide whether it will be cost-effective or not and potentially by used even in marketing like it is in this caseJ. What brings the progress, in this case, is not the fact of building batteries but rather building batteries with zero defects and best possible efficiency. Those processes are as much important as improving the quality of cars or rockets (the two other things managed by Musk). The scale and efficiency of this project will decrease the cost of batteries and in turn, decrease the cost of electric cars. This might lead to the popularization of all electric cars as more and more people will find them affordable. Ps. I used Gigafactory 1 in the title as Musk plans to open more of them around the world to cut the costs of transporting batteries.